If you are a beekeeper, you will most likely want to make an open bucket feeder at some time. The term “open feeding” refers to a feeding station that is away from the hive. The honey bees fly to the feeder – fill up with sugar syrup and fly back to the hive. It’s called a bucket feeder because… um..well its a bucket. Bucket feeders are easy to make and use. Of course, they are not the only way to feed bees and may not be the best way either. But I do feel that my bucket feeders are good to use in some situation. Remember, beekeepers have many methods for feeding bees. And we don’t agree on which one is the very best. There are as many types of feeders as they are beekeepers. All feeders have advantages and disadvantages. 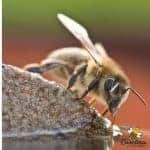 Most beekeepers try several feeding methods and choose one that fits their beekeeping style. In fact, you may use different feeding methods at different times of the year. If you think an open bucket feeder has a place in your apiary, lets explore how to make your own. What should you add to your bucket feeder? When using the bucket feeder method, I normally use a 1:1 sugar syrup ration. This is 1 part pure cane sugar mixed with 1 part warm water. You can measure by volume or weight. 5 pounds of sugar to 5 pounds of water or 5 cups of sugar to 5 cups of water. But is this the only thing to put in the bee feeder? No, I add one more ingredient. I like to include an essential oil feeding stimulate. 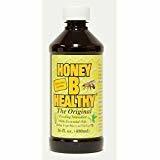 Of course, you can make your own feeding supplement for bees but I really like to use Honey B Healthy. The 16 oz bottle lasts a long time. I add a bit to my sugar syrup – only a tablespoon per gallon and it prolongs the freshness of the mix. I also add a few drops to any spray bottle of sugar water that I keep in my work box. This is something that I always keep on hand. You should also consider Brood Booster, I have received many recommendations for this recipe as well. Using an open bucket feeder is not my favorite method of feeding bees. It does provide the advantage of holding a lot of sugar syrup. However, because it is placed outside the hive, your bucket feeder will also end up feeding a lot of other insects. Wasps, ants, and hornets will also be drawn to the feeder. While they certainly have a place in the eco-system, wasps and hornets can be a pest of honey bee hives. The Yellow Jacket Wasp in particular will bother your hives. A strong bee colony will be able to repel wasp invaders but weak colonies may be at risk. Any time I can reduce the number of wasps near my beehives, I try to do so. 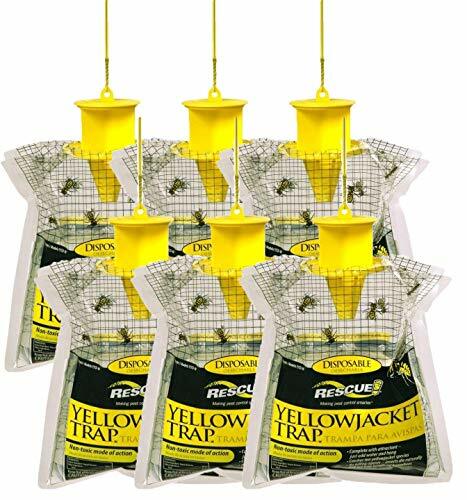 If you have a lot of Yellow Jacket Wasps in your area, consider making or buying some type of trap that will not harm your bees. 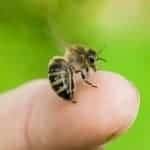 Your larger hives (that may not need the feed as much) will collect more food than the weaker hives. This makes open bucket feeding not the most economical way to help your bees. It will be necessary to purchase a lot more sugar because you’re feeding the whole insect community. Still, the volume and ease of set up gives the bucket feeder a place in my honey bee management system. It is not my primary feeding method I use it for special purposes. I use a bucket feeder as an indicator of nectar availability. Honey bees will normally prefer natural nectar that they collect from flowers. So, I can put my bucket feeder out with 1:1 sugar water. If I see a few bees interested, that’s okay. They must be collecting real nectar from flowers. If the bees are going wild over the bucket, I know that natural nectar must be very limited. This tells me that I need to implement feeding in my regular hive feeders. Or, if time will not allow for that – I need to put out more bucket feeders so the bees will not be fighting. There are many ways to provide open feeding. Some large beekeepers fill a 55 gallon drum with sugar water. They add pine needles to the drum to lessen the number of drowning bees. If you want to use an open feeding method, I think the bucket feeder is one of the best ways to proceed. It is the best way to open feed without a lot of bee deaths. One very important tip to remember!!! 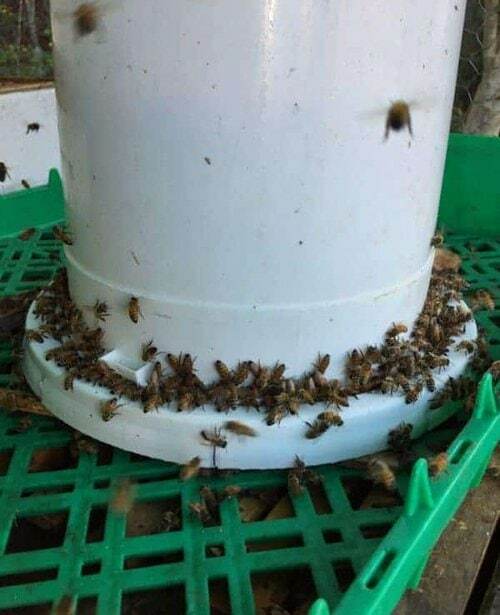 Do Not Place an open bucket feeder near your hives!! This is very important. Bees from other hives, wasps etc will be drawn to the feeder. You do not want these pests to be feeding in close proximity of your hives. This may result in weaker hives being robbed out and killed. Place your bucket feeder outside in a good location away from your hives and the bees will find it if they need it. Step #1: Find a plastic bucket (food grade is good but not essential). The bucket should have a water-tight lid and be clean. No funky smells or hazardous materials. You want one with the reinforcement rib as pictured in the video. Step #3: Fill the bucket with sugar water and invert. (test with water first). Liquid will spill out until a vacuum is created. This is messy, be outside. Step #4: Place the bucket on a level surface outside away from your hives. Open feeding is not my favorite way to providing supplemental feeding for my honey bee colonies. However, there are times when it comes in handy.